The Lynn Theatre and Wishing Wind Creations present "Miss Witherspoon" by Christopher Durang. “Miss Witherspoon” runs from February 1-16, 2019, in The Lynn Theatre, John Tyler Community College - Midlothian Campus at 800 Charter Colony Pkwy, T Building, Midlothian, VA 23114. 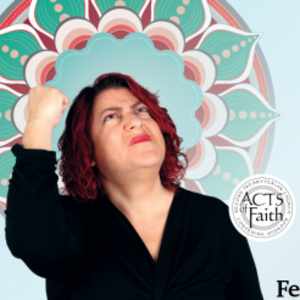 This collaboration features professional artists as well as John Tyler students and will be a fringe production with the 2019 Acts of Faith Festival. Acts of Faith Talkbacks will follow the Sunday matinees and will be moderated by Terry Menefee Gau. instead something called the Bardo (the netherworld in Tibetan Buddhism), and the forces there keep trying to make her reincarnate. So far she's thwarted these return visits to earth with a sort of "spiritual otherworldly emergency brake system" she seems to have, but when she is finally reincarnated, will she learn her lesson? This is a play about facing one's fears. even if it means returning to a world that finds new ways to terrify every day.